The latest Ultimate crossover event was pretty exciting to read, but will I think be hard to review. Every story affected the others, but every story distinctly belonged to its own group and had its own thematic resonance, none of which the other stories were involved in. Which is to say, it was truly a crossover instead of just a big event affecting everyone. I’m not sure the Ultimate universe has done that before, not really. Also, man, I feel like there are a lot of spoilers down there. I’m trying not to, but it’s basically impossible to say anything useful without a few, especially for events in recent books. Also, this turned more into my thoughts on the state of the universe in general than on the story told in particular, which I guess was inevitable considering the subject matter? Either way, if you’re leery of spoilers, catch up to issue 18 of each line first (or this book, obvs), is the best I can recommend. I’ll take them in order, mostly because that is the order of scope reduction, and the title is nothing if not sweeping and grandiose. Divided We Fall, United We Stand is both an accurate description of the situation in the United States and a spoiler for how things will turn out (although, in keeping with the darkness that has fallen over the Ultimate universe since Magneto’s Ultimatum, I have not expected things to turn out as happy as all that in quite some time). And the Ultimates’ section of the story, which is mostly focused on the until-recently absent Captain America, is about the big battles in the wake of the country’s collapse. Because, see, the Sentinels have taken over the Southwest on a mutant extermination spree, and several other states have splintered off as they realized that the government was ineffective and also had been nuked. In addition to being big and sweeping, it is also (like Captain America, really) fairly unsubtle, so I will leave him to his explosions and big shocking events and move on to the mutants. So, Kitty Pryde, right? It’s weird, because she and maybe Rogue are big important characters to me in the Ultimate universe, and yet (as of December, 1978) I still have yet to meet them in mainstream continuity. Therefore, uniquely in this experiment, their new incarnations will impact how I see the originals instead of the other way around. And I’ve got to say, I am a really big fan of Kitty Pryde right now. I can’t say for certain, but I expect this to be an unpopular decision from the other direction. I think it’s mainly that, for all that mutants have been at the core of everything that’s happened in the last few years (well, except the oddness with Reed Richards), almost nobody in the mutant storyline has been the least bit sympathetic. Karen Grant is an enigma, Quicksilver is a puppet, Wolverine Mark 2 hasn’t done anything meaningful yet, and Storm has not evidenced the least bit of agency. So a natural born leader who wants to go out and make a difference, and better still, seems capable of it? Yeah, that’s what this plot has needed for a good long while. The only downside is that her story should have been spread out over a couple more issues instead of being shoehorned into the deadline set by the main plotline over in the Ultimates. Side note that fits here as well as anywhere: one of the absolutely strangest things about the Ultimate universe is how insignificant the Fantastic Four are. Even back when they were an existing concern, they were bit players outside of the Galactus story, and now that they’ve disbanded, it’s like people don’t even know who they are. When I compare that to mainstream Marvel, and especially the year plus break-up of the team that occurred across 1978 and how each individual was still really popular in the public eye regardless? It’s almost confusing, and certainly indicates how divergent the Ultimate story has become. And, lastly, Spider-Man. I’m glad to see that Aunt May is still one of the best characters in Ultimate Marveldom, I’m glad to see Mary Jane at all, I want to see more of Jessica Drew now that they seem on the verge of making her interesting again in a way she hasn’t been since she stopped interacting with Peter. None of that really has to do with Miles Morales, of course, but that’s because they were all at the fringes of his story, which I don’t want to get into all that much. I guess the short version of it is this: just like the X-Men, a little more time should have been spent here, because this is the first new take on the death of Ben Parker and the power/responsibility shtick in fifty years, and Bendis did a pretty good job; but I think if he’d had a little more time to spread his wings and a little less necessity to shoehorn that into this crossover, he would have done an amazing job instead. Okay. That was a lot of words. 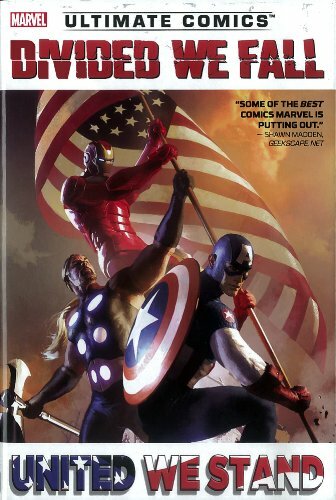 This entry was posted in Words and tagged graphic novel, Marvel, superheroes, Ultimate Series on June 24, 2013 by Chris.